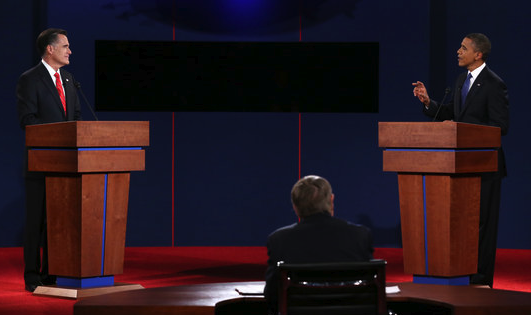 The real winners of Wednesday night’s first Presidential Debate were President Obama and former Governor Romney. I have to say that. They win — a tie. And we lose. Last night’s debate is a perfect mirror of who we are, what we’ve become. And in this America, defined for us last night, we, the people, were left wondering what’s going on? Where are we? Where exactly are we going? We’re still left wondering who these people are and, given our challenges, how are we going to approach an equitable future where everyone has their shoulders to this daunting wheel we need to push up this steep hill? Obama and Romney, no matter who is president, will forever be absolutely fine, sailing a prosperous wind to posterity. The rest of us, as it’s been made clear by both Obama and Romney, will hold them up — as we’ll hold up others, too, that have their grip on the socioeconomic reins that pave our future and may deny our dreams. In the middle of this circus, adding to the confusion, the media insisted on covering the debate as if we were watching the NFL or a boxing match, looking for zingers — body blows, as one commentator called them. Mark Shields, on PBS, actually went as far as using boxing terminology — who won what round — to bring the debate’s substance to light. Who’s ahead now? What will the polls say? The sports metaphors — all of which are place holders for a confused American masculinity — abound, but without substance; these metaphors are kept alive only to bolster a narrative that is not about us, the American people, but about them. The debate was a splendid picture of a divided America — one that’s confused, even desperate and longing, the other that demands, confines, privileges. History could have a lot to say about this, but it’s being left out as a framing device that’s essential for us to to be able to contextualize what each man is — and is not — saying about the role of government. This, after all, is at the heart of the election, at the heart of ideologies that are always warring in America. How much government do we need? For those that need a hand, those that are struggling, how big should that hand be? And how should it be applied? Who will determine when enough is enough? The debate about the government’s role began with the Federalist Papers, a document that is the foundation of this country but which no American has actually ever read — unless you’ve studied American Government in college or gone to law school or graduate school in political science. This magnificent document is left solely to those people that have to read it. Yet, America’s current ideological struggles begin and end with the Federalist Papers, a sweeping work that defines our character, our principles — and not our ideologies. Ideologies have come about because of bipartisan rancor; they come about when politicians need to conceal the true engine of government — money and who controls the purse strings. In our case, the purse strings are not held by politicians we elect; rather, they’re held, in a broken system, by those that fund the careers of politicians and demand that they receive something in return. This is why, when we need to know what’s going on, we get two adults that don’t know how to speak the truth. The end result is the debate we just witnessed — a listless encounter between two men that are nearly saying the same thing. The difference between the Democrats and the Republicans is but a sliver; the difference, defined by the extreme right, is being made more evident solely by misguided social concerns that, when you think about it, is the most egregious infiltration by government into our private lives. Nowhere in the Federalist Papers do we see such a desire — and need — to enter into the private lives of citizens, yet extremist fundamentalists want it this way. Go figure. Both men will use government to cut taxes (Romney and Obama) and create some revenue (Obama); both men will use government to regulate, differing only by degrees; both men agree that health care is a problem, and in last night’s debate Obamacare became Romneycare; both men also agree that education has challenges, Romney opting for vouchers and charters, Obama for bolstering public education and charters — both plans disastrous and failing to see some real urgent problems, such as ridiculously bogus teachers, a lack of resources, standardization, and the effects (this data from science and medical research) of poverty on the minds of children; and, both men agree that a strong military is essential, particularly as demands in the world continue to challenge our readiness in cyberspace, clandestine operations and special forces. We’re nowhere new. We’re in the same Bush-Cheney era, showing us how damaging it is to follow this uncreative path: drone strikes will continue, as will clandestine operations, as will the support of Israel, even when hawks rule this policy; poverty will increase as either man’s broad, even ambiguous statements pursue a line that’s been always ongoing, business first, the rest will just have to come along, picking ourselves up by our bootstraps — sink or swim; education’s achievement gap will widen, as some kids will have better access to better teachers and creative uses of technology, others will whither; health care costs will increase as America continues to increase its girth, beers in hand, pop corn on the lap, chips flying into our wide open mouths, watching the NFL, which is far more important to us (witness the outcry during the referee strike) then how we’re going to get along, move forward, and provide a future that is healthy, safe and creative. Prevention, whether its preventive health practices, a preventive, inclusive educational system that conflates socioeconomic needs, the environment and health care with self-actualization, an energy policy that prevents further deterioration and that doesn’t sustain us, because that’s now impossible, but rather begins to learn how to live with the disasters we’ve created, offering up creative, technologically rich solutions, is out of the question. Not even on the radar for Obama and Romney. Frankly, it’s disgusting. Both men failed at describing, concretely, how we’re going to pay for the mess we’re in — except to say that the middle class is going to be burdened, either way; we’re the ones who will lose footing, while some, granted, will gain something or other, though very little and will always be looking over their shoulders wondering when it’s all going to cave in. But it’s safe to say, in either man’s rather nebulous picture of the American Future, the ideological lines of demarcation will be greater, the fallout more dramatic, the result being two, maybe even three unrecognizable Americas. Nothing like this was foreshadowed in the Federalist Papers. Nothing. A selfish ambition, rather then ambition tempered by ambition, which is what Hamilton said, is killing us. We don’t know where we are, in then end, nor where we’re going, except that it looks bleak. This entry was posted in Citizenship, Class, cultural studies, education, Fundamentalism, Inverted Totalitarianism, Media, NBA, Obama Administration, Public Health, Race and Ethnicity, Socio-Economic insecurity, technology and education, The Constitution of the US, the Environment, Uncategorized by hector. Bookmark the permalink. Interesting Mr. Vila, very interesting. My take on it is that we are on the verge of mental eradication. Times are no longer changing for the better. We say our technology is advanced, school systems are better, food is better, clothes, music, etc. But the people are not getting any better. We regress and stress every day. America institutionalizes dreams and recycles them to be the epitome of the American dream. I personally do not vote because I think it is pointless. I believe voting is one of the few moments in America where we get this vague idea that our opinions truly do matter. And we still keep telling ourselves “we are free,” “we live in a democracy.” The truth is we live in a hypocrisy. Coming from a predominatly African American community, I see how the election of Obama has done more evil than good. I always say that Obama is that illusion of hope that America needed in order to fool the people into thinking they are truly united. We chanted “yes we can” from section 8 apartment buildings, welfare lines, soup kitchen tables, and street corners. We knew nothing of his policies, but were mesmerized by his skin. We were Bamboozled by Obama. He made us believe in equality. He made us believe in America. Obama misguided many minds as he did inspire. I cannot count how many times I ran across people in my community who told me they voted for Obama simply because his Black. That thinking right there is the reason why we cannot move forward. To touch base on Romney, I am afraid. It frightened me to hear him confidently and boldy speak his mind freely about how much he will take away from the little pot of prosperity the American people have. Am I the only one who thinks this is absurd? Are we becoming such a normalized culture of oppressed people? Are we accepting our demise? Are we tired of fighting for what is right? The only geniune way to achieve democracy and equality lies with the people. Yes, you! If you look at American history, the only way changed has ever occurred was when the people said “I am as mad as hell and I’m not going to take it anymore!” When people marched and rioted! (effectively) Revolutions! Chaos! The people needed anarchy to achieve democracy. How do we achieve that? We start learning. We start educating ourselves instead of imprisoning ourselves. I wholeheartedly believe once a significant amount of people in this country realize how insane the system is, change will come. We need to retrieve our undying desire to fight back! When the people truly unite, organize, and strategize to effectively go against the instituion that is America, WE WILL create a new effective America. Network is a film from my generation, something we all saw. I’m not sure what you mean by “mental eradication,” though. I’m afraid and sorry to say that many African Americans feel as you do — Cornel West and Travis Smiley leading the pack. But I still think that if don’t vote, even when we have such choices, this aspect of our lives will be taken from us — do we want that? Thank you for commenting! Thank you for thinking about these important ideas!